With a height (from left to right) of 21 cm (8 in.) and a width (from top to bottom) of 11.5 cm (4.5 in. 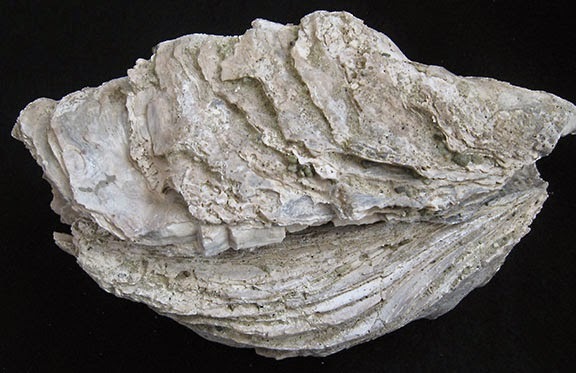 ), the above-pictured oyster is a "giant" and large and heavy enough to be an effective door stop. It is a complete specimen of Crassostrea titan of late Miocene age (about 10 million years ago) from the Coalinga area, central California. Specimens about twice as big as the one shown above are commonly found in this area. Unlike many oysters, Crassostrea has two almost equal-sized valves. This genus can reach sizes up to 60 cm in length. 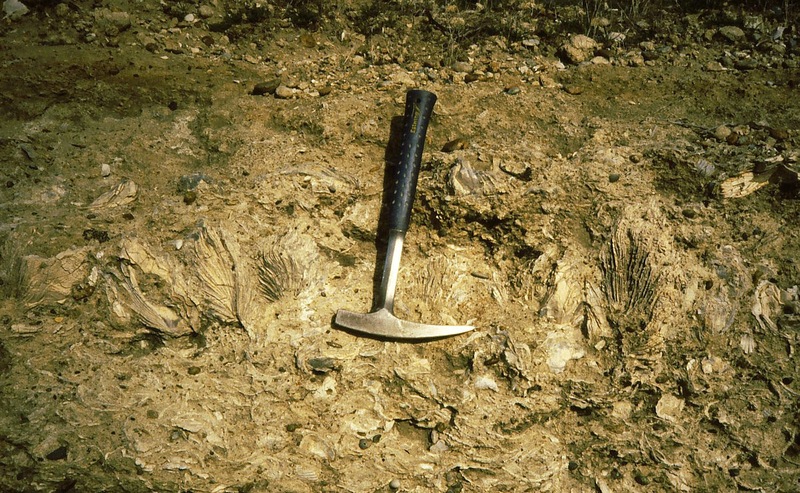 Crassostrea has a geologic range of Early Cretaceous (about 120 million years ago) to recent. These are exterior views of two valves of another, but-same sized specimen, of C. titan. The one on the left is the left valve, and the other one is the right valve. These are interior views of the same two valves shown above. The one on the left is the left valve, and it is 21 cm (8 inches) in height (from top to bottom). It has the ligamental area (a prominent groove) at its top, and that is where the ligament was located. The ligament consisted of a band of elastic material that helped open and close the valves. The other valve (right valve) has a projecting massive structure called the buttress, which fitted into the corresponding ligamental area. The adductor muscle scar is readily visible near the bottom edge of the right valve. A corresponding scar on the other valve is covered by rock matrix. The adductor muscle was the very strong muscle that helped keep the two valves tightly held together. For most oysters, the left valve (always referred to as the "lower" one) rests horizontally on the ocean floor. Specimens of C. titan found in living position in the upper Miocene Santa Margarita Formation in the Coalinga area (see picture above), however, are found with both valves oriented vertically. Their specimens, which rest closely against each other, are massive and heavy, and it seems that they must have used gravity to help slightly open their valves. The rock hammer in the picture is 12.5 in. long.